I'm creating an application where a user can have n dependent users (that doesn't have the same permissions as the principal user). 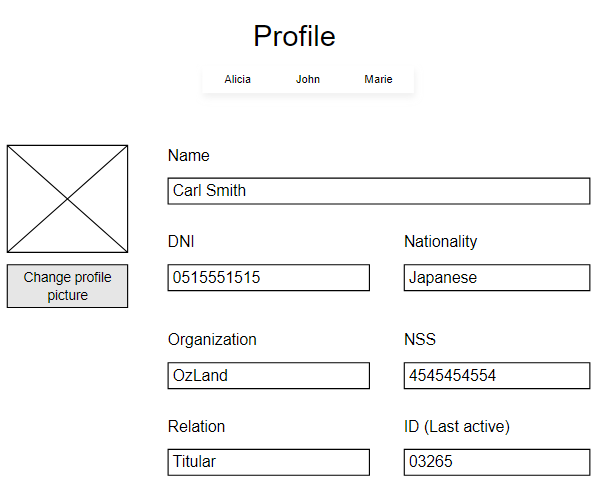 Ex: Carl Smith is the principal user and has for dependents: Alicia, John, and Marie. In almost every view of the app Carl, the main user must have the ability to toggle the view between his dependents users. When he toggles the view he will be on the same page but the data will be the dependent user data. 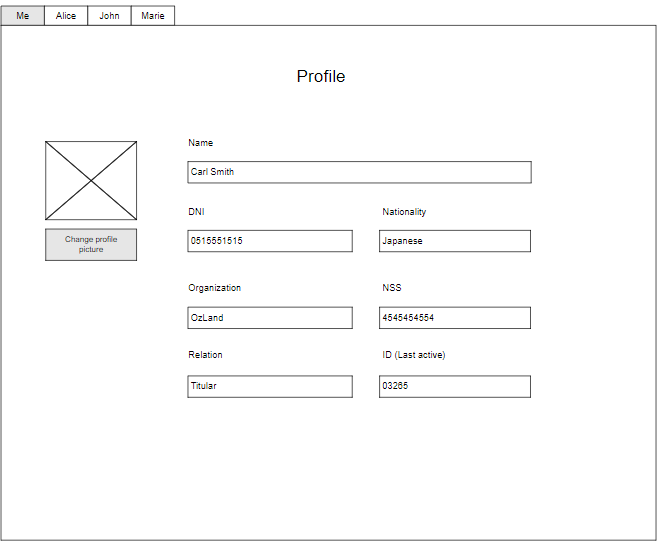 At first, I thought to display the main user and dependents data but it will be much, so the toggle idea came in. Know I'm trying to figure out how to design the toggle ability but it just doesn't feel ok. If you have a different idea than the toggle it will be. Have a kind of tab control in the pages when the user clicks it can toggle the view. Have a tab contain the pages and when the click in another tab to change the user that display the same layout with different data. 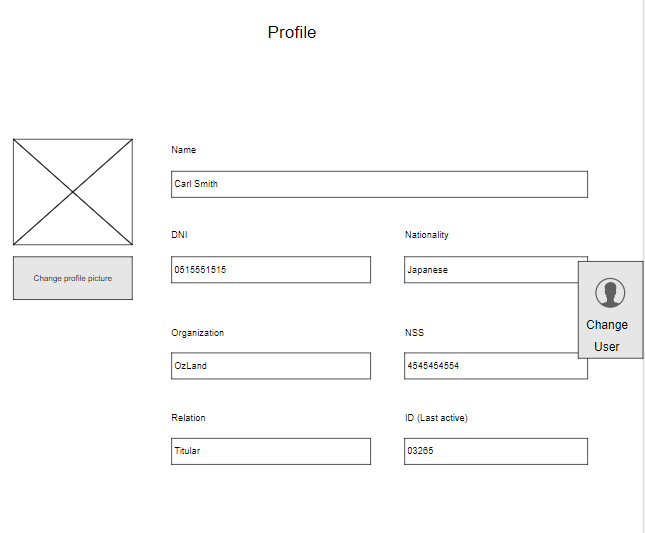 Have a floating button, when hover it will display the user list and then click in one will change the data of the view. Have a select in the top of the page where the user can be changed. I really like idea #1 but if the users are > 5 is going to be to much, idea #5 is the most user friendly for n > 10 users but there will be a navbar in the top of the page and that will look so awkward (I prefer side navs for apps, but the navbar is a requirement). 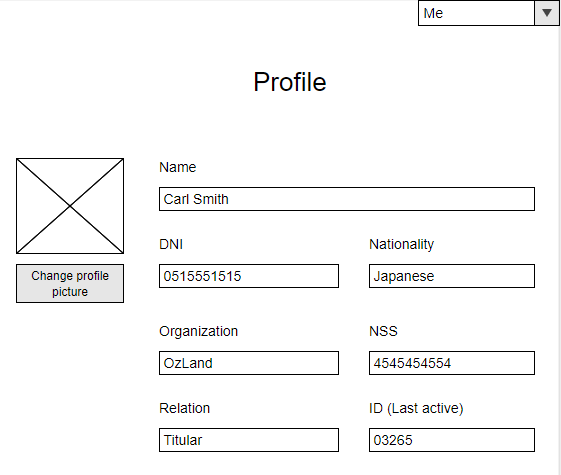 The main user, Carl, is on his profile page while checking his data he remember that he has to change the address of his dependent John, so he looks for John (this is where I need the interface, UX...) and the profile data changes to John data, then Carl moves to plans section, where he will see his plans, not John plans, because he is the main character and checking data of other dependent is a more ephemeral action. He can at the same time have the need to check the plan for John and then Alicia, so toggling profiles like Google does can be a hassle. The main user must have the ability to toggle the view between his dependents users. When he toggles the view he will be on the same page but the data will be the dependent user data. So, according to me the best approach would be #3. The view toggle function should be on top of the entire application and not on the page as on toggling the view, the page data is only changed and not the entire page. From page to page the toggle view is not changing only the behind applications pages are changing. 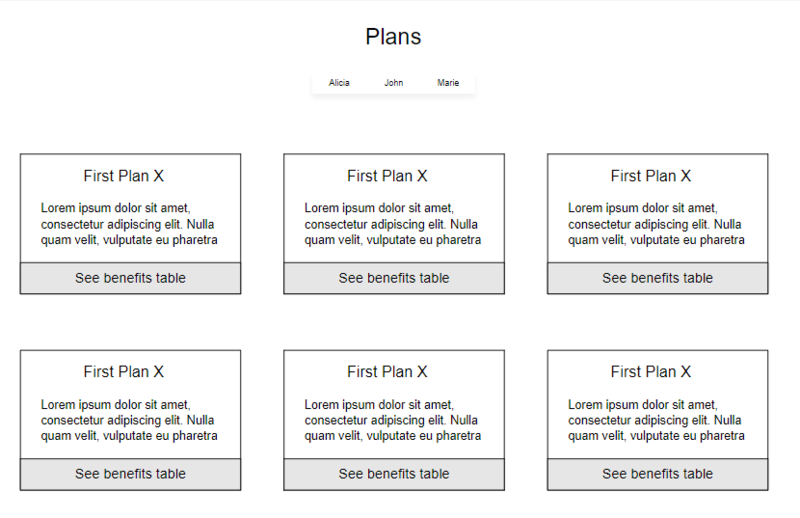 Even if the count of the dependent user grow, this design can be optimized more efficiently to handle it without complicating the UI of the control. The above points made me drop your ideas #1, #2 & #4 one by one and finalize on #3. How frequently a function is accessed matters a lot in designing an interface like this. If the frequency is not high, you can safely put this option in the top navbar. Users of the web are accustomed to having their 'profile' up top at the right hand corner. If you carry out a usability test where there this toggle is simply not there at all, users will probably fiddle around with the controls in the right top where they usually find their profile settings, sign-in and sign-out etc. Your idea # 4 would work well. LinkedIn used to have an option to view your profile as other users see it. What you're describing here reminds me of that. You're not switching users (which, in my mind, eliminates options 1-3), you're simply changing your view. I recommend a dropdown like the one you have in your option 4, accompanied by the label "View as:" or "View [page name] as:"
When the user switches their view, give them feedback somewhere on the page, something like, "Now viewing [page name] as [username]." Not the answer you're looking for? Browse other questions tagged website-design user-behavior web-app interface or ask your own question. Is it good to create a separate screen for change password? Do I really need a back button? How can web interface for resetting programmatic access keys protect users from accidentally repeating the action? Which price in a package plan should be emphasized?